Since Apple has introduced a new Thunderbolt Displays, which is scheduled to begun shipping in the upcoming weeks, users wondering for a new product which aims to provide same dock functionality to them but without any purchase of Display, or with $999 price tag. Belkin today has showed up their magical device to public, which is going to provide same functionality to users without any extra display screen. The company is using this week’s Intel Developer Forum to show off a new docking station offering essentially the exact same connectivity as found on the back of Apple’s new display. 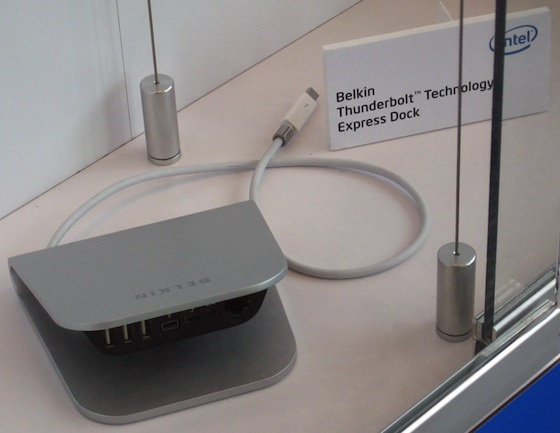 The Belkin Thunderbolt Express Dock features three USB ports, a Thunderbolt port for daisy chaining, a Firewire port, and a GbE port. This is basically the same port setup that’s found on the new 27” Apple Thunderbolt Display. For Apple users looking for expanded port offerings via the Thunderbolt port and don’t want to pay $999 for the functionality, the Belkin Thunderbolt Express Dock will come in handy. Unfortunately, there is no word yet on pricing or a launch date for the docking station, so users will have to wait for Belkin to release more details.